This is my new website..I am in the process of building it so be patient and enjoy the recipes here on my blog.. 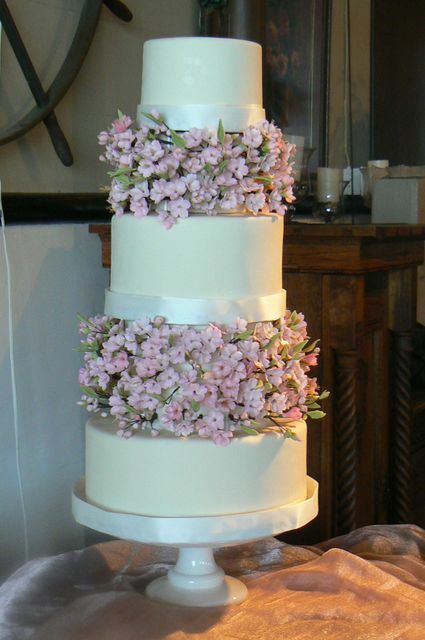 Pretty little wedding cake in pale pink with cornelli lace and sugar flowers. 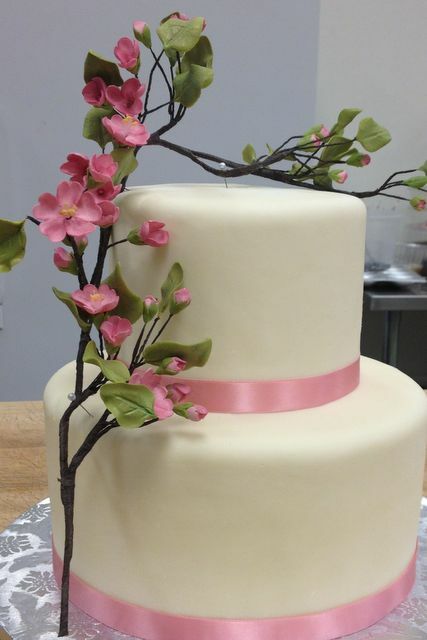 This is one of my earliest wedding cakes for my student, Carmen who has recently had a baby! Congratulations dear Carmen!! Vanilla butter cake is more delicate if you substitute a portion of the unsalted butter with vegetable oil. The crumb will be tighter and the cake will be softer. Tweaking recipes for artisan cakes comes with practice, time and understanding the fundamentals of baking. 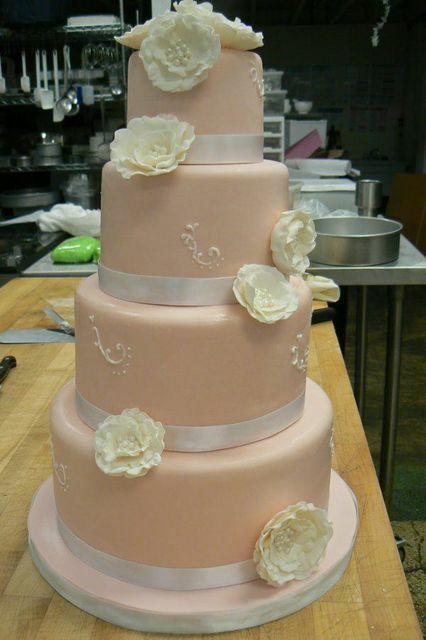 Buttercream decorating also takes time to learn and master. Prepare 2 8″ cake pans and preheat the oven to 350 degrees F.
Cream the butter, oil and sugar together until light and fluffy…approximately 10 minutes. Add the vanilla and the eggs one at a time. Sift the flour, baking powder and salt together and alternate the incorporation of the dry ingredients with the milk in thirds. Divide equally among the two cake pans and bake for about 25 to 30 minutes until golden. The cake should spring back when you touch it. Cool in the pans before removing the cakes and chill well before filling. Because butter cakes are a bit more dense than a Vanilla Chiffon cake, fillings that are on the sturdy side are good but mousses are good as well. Just cut your layers of cake thinly..so two layers of cake would become four layers of cake with three layers of filling. 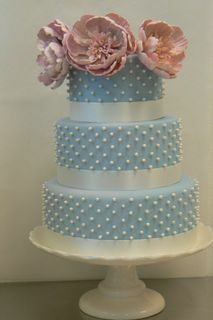 The recipe will make two tiers of cake like this one. Remember to build your cake in a lined cake pan and chill well. Using two mixers with whip attachments, place the yolks in one bowl and whites in the other mixer bowl. Add the water, oil and vanilla to the yolks and combine all on low speed. Sift the flour into a bowl and add the hazelnut meal with the baking powder and salt plus 5 ounces of the granulated sugar. Whisk together so that the hazelnut meal is well incorporated into the flour. Begin to whip the egg whites on medium high. Add the 9 ounces of granulated sugar to the whites when they are at the soft peak stage. Whip the whites until they are soft but completely hold their shape. Put all of the flour/hazelnut mixture into the egg yolks and whip until well combined. Scrape down the bowl and whip on high for about a minute. Fold the whites into the yolk/hazelnut mixture until they are very well combined. Remember that you have baking powder in this cake so the possibility of the cake falling is remote. Divide into your cake pans and bake for about 25 minutes. This is enough batter for 3 8” cake pans and 3 5”cake pans. 5 ounces of batter can go into the 5” cake pans and 12 ounces of batter an go into the 8” cake pans. Bake at 350 degrees F for about 25 minutes.. In the bowl of a heavy duty mixer whip the yolks and whole eggs until they are light and fluffy. Moisten the granulated sugar with ¼ cup of water and boil it to a temperature of 240 degrees F.
Whip the cream to soft peaks and refrigerate until needed. When the syrup is 240 degrees F, pour over the whipped egg mixture in the heavy duty mixer and allow to continue to whip until cool. The melted chocolate should be no cooler than 90 degrees F. when you pour it into the cooled egg mixture. The chocolate needs to be immediately and with some vigor folded into the eggs. Fold in the whipped cream and thoroughly blend. Add the vanilla and you have the most delectable chocolate mousse ever..! Flavor with praline paste for a hazelnut mousse by putting a couple of scoops of the praline paste in with the melted chocolate before you add the chocolate to the whipped eggs. You can ice the cakes with Italian meringue buttercream flavored with chocolate or just vanilla. To flavor buttercream with chocolate, you need to melt a weight of chocolate that is 25% of the total weight of the buttercream you are going to flavor. If you have 28 ounces of Italian meringue buttercream, which is a single recipe, you need to melt 7 ounces of good chocolate. Your simple syrup should be made by boiling 1 cup sugar in 2 cups water for 10 minutes and make sure it is cool before adding the Frangelico liquor. Flavored syrups are good in refrigeration for a week or so but it is always best to use all your products as soon as possible. Line the cake pans with plastic wrap and place a prepared layer of cake in each pan. Brush layer of cake with Frangelico syrup and pipe a dam of Italian meringue butter cream around the rim of each cake layer. Fill with hazelnut mousse, top with another layer of cake, brush with syrup, pipe the dam and fill with the mousse..top with the final layer of cake upside down and brush with syrup. Refrigerate for at least 8 hours. Remove from the pans and invert on cake boards right side up so that the syrup continues to move downwards. Ice with Italian meringue buttercream and if you are going to cover your cakes with white chocolate fondant, chill them very well before hand. 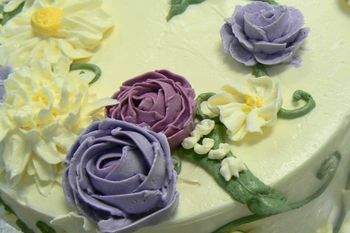 Remember to always ice your cake boards so that the fondant has something to adhere to at the very bottom of the cake. Stack as you would with support dowels in the 8″ tier. You can glue the cakes with royal icing on the top of the 8″ cake or just assemble at your venue or at home so that there is no dowel mark showing on top. Some people will create a hole in the bottom of the top tier of cake through the cake board and place a dowel half way up into the top tier. It is up to you to discover what works best for you. 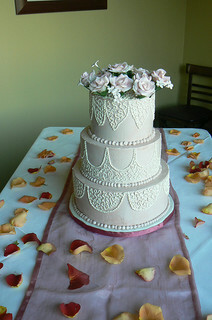 People are apprehensive about doweling cakes and putting stabilizing dowels in cakes. You just have to do it enough times successfully so that you gain confidence. Sift together the flour, the baking powder, salt, 2 ounces of the sugar and set aside. Add the almond meal to the flour mixture and blend well. Separate the eggs. Whip the whites to the soft peak stage and add in a thin stream 5 ounces of granulated sugar. Whip to stiff peak. Put the yolks into a bowl of a heavy duty 5 quart mixer with a whip attachment. Add the water, oil, vanilla and almond extract. Whip until well incorporated. Add the flour mixture all at once to the yolk mixture. Blend well and then scrape down the bowl. Blend for about a minute more and then fold in the whites. Make sure there are no lumps of whites visible to the eye. Pour into prepared cake pans. Bake for 20-25 minutes. Cool in the pans 15 minutes before depanning. Chill thoroughly before filling. Make the simple syrup by boiling 1 cup of sugar with 2 cups water for 10 minutes. Cool and add the liquor. You can spread a thin coat of chocolate glaze on the layers of the moistened cake and then fill with vanilla Bavarian cream. A thin layer of Cherry Preserves would be nice. Chocolate mousse is good as well. I find Bonne Maman Cherry Preserves, made in France, to be the perfect cherry preserve for this cake. It is difficult to come by tart cherries, not impossible, but not easy. The cherry preserves shown here are the perfect in this delightful almond cake. Swedish butter cake contains a pound of butter for 4 eggs which makes it very rich. The average American butter cake contains about 8 ounces for 4 eggs so you can see what a treat you are in store for with this beautiful cake. I will fill the cake layers with a generous layer of the cherry preserves and then put a layer of vanilla buttercream over them. Try this combination. You will love it and your brides and grooms will love it as well. Preheat the oven to 350 degrees F. Prepare 3 – 9″ cake pans with pan release and line the cake pans with rounds of parchment paper. Alternate the dry ingredients with the milk in thirds starting with the flour, then adding half the milk, more flour, the other half of the milk and ending with the flour. Scrape down the mixer well including the paddle. Mix the batter for a minute making sure there are no lumps of flour in the batter. Divide the batter evenly between the prepared pans and bake for about 25 minutes or until golden brown. Remove from oven and cool in the cake pan. When the cakes are cooled, chill them in the refrigerator before depanning. Run a knife around the cake pan to release the cake, invert the cakes onto a cake board and prepare to fill by trimming the tops of the cakes evenly with a serrated knife. Build the cakes in a plastic wrapped lined cake pan using a layer of cake, a generous amount of cherry preserves, a thin layer of Italian meringue buttercream on top of the preserves..repeat ending with a top layer of cake with the bottom side up.